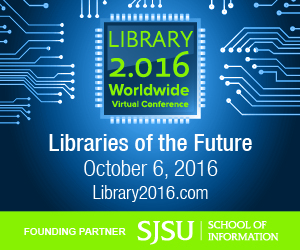 We're just over a week away from our free Library 2.016 online mini-conference, "Libraries of the Future" on October 6th! Join the 4,000 others who have already registered to participate or watch the recordings now and we'll also send you our curated resource conference reading packet: 11 downloadable reports and tool-kits, 18 articles, 10 websites, and a YouTube video playlist--all focused on key ideas and trends for libraries of the future. Library 2.016: Libraries of the Future will be held from 12:00 - 3:00 pm US-Pacific Time on October 6th (click for your own time zone). The session and keynote speakers are listed below. The presenter schedule will be sent to registered attendees next week. Be sure to also join the Library 2.0 network to be able to connect with and correspond with 22,000 other individuals in the library world, and to be kept updated on this and future events. As libraries shape their futures – and adapt to the future needs of their communities – what are the near- and long-term trends that point to our brightest opportunities. What can we learn from library innovators and innovators from other sectors and industries that will help us shape the future we want and that our communities aspire towards? Explore with us some of the key trends that point toward specific futures for libraries, and engage in conversations with civic, social, and education innovators to learn more about what they think about the future, and how libraries can become an integral part of their future visions. Libraries and librarians are well-positioned to envision the future – at the intersection of information, education, technology, and community – and this dialogue will help bring our best thinking together with the exciting visions of our collaborators, allies, and partners. The School of Information at San José State University is the founding conference sponsor, and this event is being held in collaboration with ALA’s Center for the Future of Libraries. Please register as a member of the Library 2.0 network to be kept informed of future events. Recordings from previous years are available under the Archives tab at Library 2.0 and at the Library 2.0 YouTube channel. Participants are encouraged to use #library2016 and #librariesofthefuture on their social media posts leading up to and during the event. Miguel Figueroa works at the Center for the Future of Libraries, a new initiative from the American Library Association that works to identify trends relevant to libraries and the communities they serve. He has previously held positions at the American Theological Library Association; the American Library Association's Office for Diversity and Office for Literacy and Outreach Services; New York University’s Ehrman Medical Library; and Neal-Schuman Publishers. He is a graduate of the University of Arizona’s Knowledge River Program, an initiative that examines library issues from Hispanic and Native American perspectives. As Director of the Aspen Institute Dialogue on Public Libraries, Amy is leading a multi-year initiative to explore, develop and champion new ways of thinking about U.S. public libraries. She is the author of the Dialogue’s 2014 vision report, Rising to the Challenge: Re-Envisioning Public Libraries. As Director of Journalism Projects for the Communications & Society Program, Amy has led the development and execution of many domestic and international journalism-related initiatives over the past ten years, including the Arab-U.S. Media Forum, the Aspen Institute Symposium on Critical Issues in Journalism at the U.S. State Department, the Aspen Institute Dialogue on Journalism and National Security and the white paper series inspired by the Knight Commission on the Information Needs of Communities. This work has focused on policy and innovations to foster universal broadband access and adoption, digital and media literacy, local journalism and information hubs, public service media, civic engagement, and government transparency. Prior to joining the Aspen Institute, Amy served on the staff of United States Senator Sam Nunn and worked with the Library of Congress Motion Picture, Broadcasting and Recorded Sound Division on the creation of a national television news archive. Amy holds degrees from the University of Virginia and the University of Texas at Austin. Jesús Gerena joined FII in 2010, bringing more than 15 years of experience as a community organizer. Jesús is a member and Co-Chair of the English for New Bostonians Oversight Committee, and serves as a board member for the New England Grassroots Environment Fund and the Boston Foundation for Architecture. He is also a 2015 Barr Foundation Fellow, in recognition of his extraordinary contributions to greater Boston. Prior to joining FII, he served as the Deputy Director of the Hyde Square Task Force, a program dedicated to empowering and engaging youth in turbulent neighborhoods. Susan Hildreth is currently serving as the inaugural Gates-funded professor of practice at the Information School at the University of Washington in Seattle. She recently stepped down as the Executive Director of the Peninsula Library System, the NorthNet Library System, the Pacific Library Partnership and the Califa Group and continues as a strategic advisor to those groups. She is the Treasurer of the American Library Association and is a fellow at the Aspen Institute’s Dialogue on Public Libraries. Hildreth is past president of the Public Library Association (PLA) and has served as a member of the PLA Board of Directors and an at-large member of the ALA Council. She is a member of the Public Library Association and the Association of Specialized and Cooperative Library Agencies. She also was active in the LAMA (now LLAMA) Buildings and Equipment Section. She is a long-time member of the California Library Association, which she served as president and treasurer. She was also active in the New Jersey Library Association in the 1970s. Hildreth has recently concluded her four-year appointment as director of the Institute of Museum and Library Services (IMLS), where she oversaw grant programs and initiatives that have resulted in $857,241,000 in financial support for libraries and museums and increased the visibility of libraries in the federal government and nationally. Previous positions include Seattle City Librarian, California State Librarian, City Librarian of San Francisco and Deputy Director of the Sacramento Public Library where she was responsible for multi-million dollar budgets. In fall 2016, Susan will begin a two-year appointment as the inaugural Gates-funded Professor of Practice under the University of Washington Information School’s (iSchool) “Future of Libraries” Initiative, where she will teach, engage with curriculum innovation and complete a research project. In March 2015, the Aspen Institute appointed Hildreth a Communication and Society Program Fellow. She provides counsel on issues related to public libraries and represents the Institute’s Dialogue on Public Libraries as a speaker at outside events. She is a member of the CENIC (Corporation for Education Network Initiatives in California) Board representing public libraries. She is also a member of the national Reach Out and Read Board, the Library of Congress American Folklife Center and Literacy Awards Boards, the Syracuse University Library Advisory Board and the San Jose State University School of Information International Advisory Council. She was a member of the Freedom to Read Foundation Board from 2009-2011. In 2012, she received the Distinguished Public Service Award from the College of Computing and Information Science at the University at Albany. In 2014, she was recognized as a California Emerging Technology Fund Champion and as the Rural and Small Library Champion by the Association of Rural and Small Libraries. `Hildreth holds a BA from Syracuse University, an MLS from the State University of New York (SUNY) Albany and an MBA from Rutgers University. Sandra Hirsh is Professor and Director of the School of Information at San José State University. Prior to joining the School as Director, she worked in the Silicon Valley for more than a decade at major technology companies: Hewlett Packard and Microsoft. As an industry user experience researcher, leader, and manager, she contributed to R&D research projects and influenced the user experience of web, mobile, and TV consumer products resulting in 5 U.S. patents. She was previously an assistant professor at the University of Arizona, and has taught courses for San José State University and the University of Washington. Dr. Hirsh's research focuses on information-seeking behavior and understanding the information needs of a broad spectrum of users in the United States and around the world; this work has been published in peer-reviewed journals and has appeared in international conference proceedings. Her leadership roles include serving on committees for the American Library Association (ALA), the International Federation of Libraries Association (IFLA), the Special Libraries Association (SLA), and as the Past President of Association for Information Science & Technology (ASIS&T). Nigel Jacob is the Co-Chair of the Mayor’s Office of New Urban Mechanics for the City of Boston. With an extensive background in collaborative, citizen-facing technology projects, Nigel Jacob co-founded the Office of New Urban Mechanics – a civic innovation incubator within Boston’s City Hall. Nigel also serves as Mayor Menino’s advisor on emerging technologies. In both of these roles, Nigel works to develop new models of innovation for cities in the 21st century. Prior to joining the City of Boston in 2006, Nigel worked for and launched a series of technology start-ups in the Boston area. Nigel is also a fellow at the Center for the Advancement Public Action at Bennington College. In recognition for their ground-breaking work in Boston, Nigel and Chris Osgood were both named Public Officials of the year in 2011 by Governing Magazine. Grif Peterson is learning lead for Peer 2 Peer University, where he oversees all learning design and is primarily responsible for the development and growth of the Learning Circle program. He has seven years' experience working in education, including as a research assistant with the Learning Initiative at the MIT Media Lab, academic affairs officer at the University of Central Asia, and an analyst in the higher education group at Morgan Stanley. He holds an M.Ed from the Harvard Graduate School of Education.